For years we had the lingering unanswered question in F1: just how good is Nico Rosberg? Well, at last, this year with a quick car and a known quantity as his team mate we're getting an answer. He's very good. To say the least. And what we saw from Nico for the entirety of the Monaco weekend, not least in the race, was quite immaculate. In topping every session then leading every race lap and winning it's not exaggeration to say it was the sort of performance that any of the sport's greats of past or present would have been thoroughly proud of. He dominated from the moment a wheel was first turned and unlike in previous rounds there barely seemed a join between his practice/qualifying speed and his pace when it really matters on the Sunday. He controlled the race expertly, always appearing a master of events no matter what they were behind (and there were a few). And make no mistake, this was no follow-my-leader cruise taking advantage of Monaco's legendary inability to offer passing opportunity, Nico always was able to put a gap between himself and the cast of revered drivers making up those following. And it was a result that hung heavy with reminders of the past. Nico spoke a lot this weekend about racing an F1 car around the very same streets that once upon a time he made his journey to school in. And furthermore, the race marks thirty years since Nico's father Keke won the Monaco Grand Prix for himself. Just as with Keke it was Nico's second Grand Prix win. And just as with Keke there was little doubt over the identity of the winner from an early stage of race proceedings. 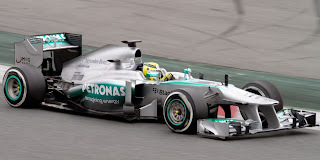 The only minor regret for Rosberg and his team is that the latest round of fuss over the Pirelli tyres - this time the revelation that Mercedes had taken part in a three-day tyre test since the Barcelona race which doesn't on the face of it seem to chime entirely with in-season testing rules - may lead some to conclude that the win and that the Mercs held their tyres together today could be attributed to that. It would be premature at least (and possibly just plain wrong) to say so though; let's not forget that tyre wear at Monaco has always been low, as well as that Mercedes was strong in the Monaco race last year too. The big matter now for the Silver Arrows is the extent they can repeat this form at more 'typical' venues. It was a strange, bitty race, broken up by two safety car periods and a red flag. It was a slow burner too, with the first stint something of a go-slow, before everyone simultaneously it seemed decided to cut loose. The field was bunched throughout (far behind Rosberg at least), and there was a lot of Dan Dare action from the likes of Sergio Perez and Adrian Sutil, though the flipside is we got a few prangs too (hence the safety cars and red flags). Meanwhile the likes of Kimi Raikkonen and Fernando Alonso who have championships to think about had to rather grin and bear it as those around them threw caution to the wind. In Kimi's case he was shunted down by late contact with Perez, which necessitated a stop because of a puncture (and it eventually ended Perez's race). While Fernando was ambushed three times, as well as late on had part of Perez's car lodged in his, which slowed him in the final laps. So not his day all in. All of this meant that Alonso could finish only seventh while Kimi salvaged tenth from the wreckage (literally) with a late charge. And while all of this was going all Sebastian Vettel stayed ahead of the mayhem, and even gained a place after some odd tardiness by Lewis Hamilton before pitting behind the safety car. It meant Seb got a handy points haul of 18 for second place on a day that his two nominal title rivals struggled. For all of the controversy about tyres not suiting the car, it perhaps not quite ruling the roost on pace as it once had etc in 2013, it's being missed somewhat that driver and team can be said to have maxmised their result every time this year so far. As a consequence, Sebastian Vettel is doing a grand job winning the title by stealth. 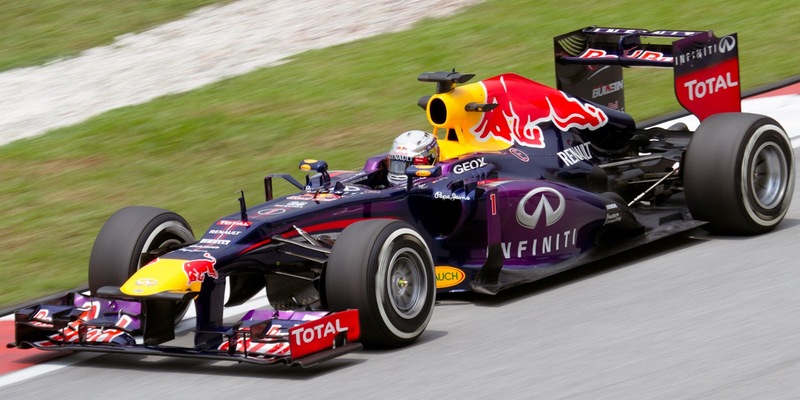 Red Bull-Vettel isn't just about Adrian Newey, the driver-team combo is good at everything. The other Red Bull piloted by Mark Webber completed the podium, followed by Lewis. Next up was the star interloper (at least the star that got to the end unscathed) Sutil, and Jenson Button in sixth, displaying his usual balance of aggression and restraint. Jean-Eric Vergne also kept his nose clean to finish eighth, and Paul Di Resta was very racy in coming ninth. But in a town not short on ostentation, there was only one star today. That of Nico Rosberg, a star for which the mist in front of it is lifting finally, and now we can all see how bright it shines. Good post. Nico is surprising me a lot at this start of championship, I did not expect him to be as competitive... and maybe Hamilton is as surprised as me. In fact, Rosberg is the driver with best results en GP2, except for a driver... Hamilton.